The episode kicks off with the Midnight Society gathering for their weekly meeting at the campfire. They're in the middle of making fun of Kristen for being a girly-girl when they hear howls in the distance. Suddenly, a hound dog emerges from the thicket and Kristen follows after, leash in hand. I think she's got a story for us. AYAOTD? 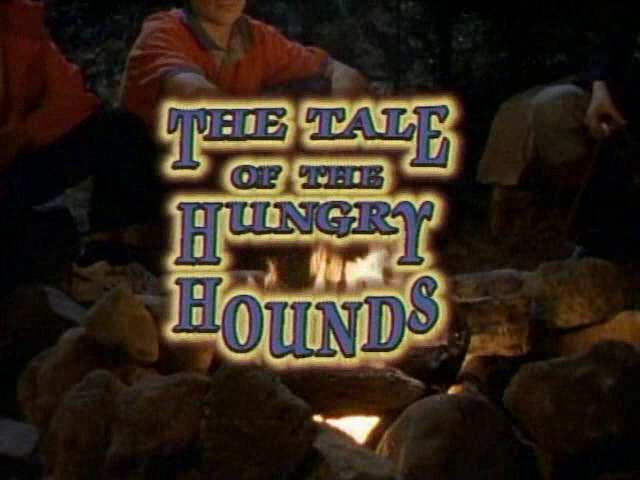 -- S01E05 -- "The Tale of the Hungry Hounds"
The tale begins with panning shot through an attic packed to capacity. 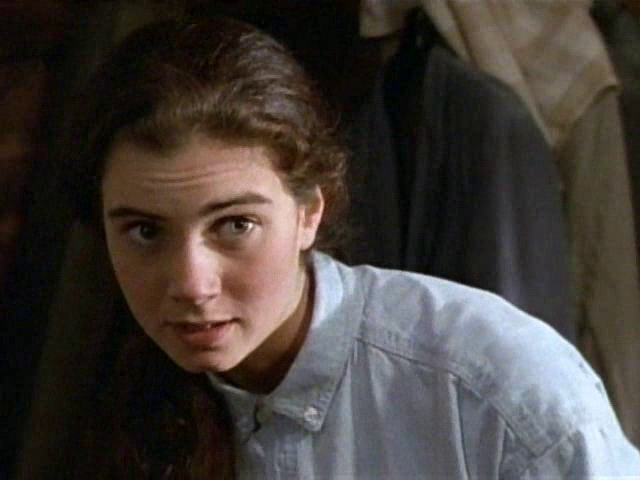 We close in on a girl, Pam (played by a young Mia Kirshner! ), rummaging through an old trunk of horseback riding clothes. She yells for her friend, Amy. A voice calls out, but it doesn't sound like Amy -- so Pam goes and investigates. 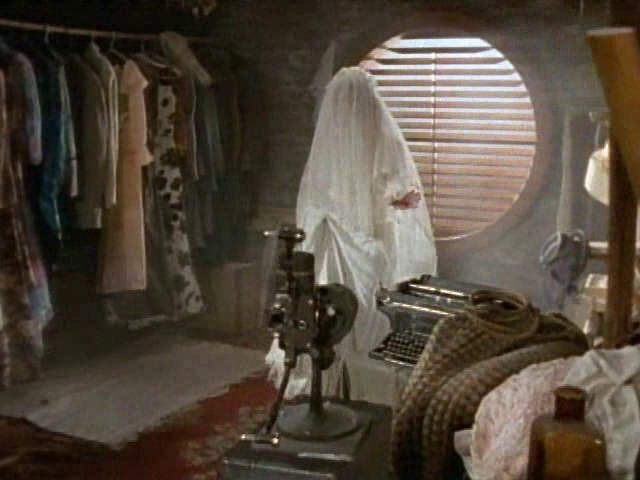 And she's confronted by a haunting image of a ghostly apparition in a white wedding dress. But fear not. The "ghost" is just Amy playing a prank on Pam. Oh, kids. Pam goes on to talk about how she doesn't believe in ghosts, when all of a sudden, a trunk falls and opens, spilling its contents onto the floor -- mostly papers. The two eventually stumble upon another trunk. This one has the name of Dora Pease on it, and a date, 1963. They see a picture of Dora and she looks just like Pam. Pam's mom soon pulls up in her car, just as Amy and Pam are petting a horse. Pam's mom strongly dislikes horse riding -- says it's dangerous. Later, the two girls pull out an old Ouija board. And of course, the old "I'm not moving it. Are you?" takes place. The board reveals the combo for the trunk in the attic, 1-4-9. They open the trunk and find Dora's old riding uniform. Pam puts it on and is instantly taken over by the spirit of Dora. Pam walks to the attic window, and it opens, revealing a mystical staircase leading down to the lawn. What the hell?! Pam walks down the stairs and Amy follows. Amy pleads for Pam to return, but she's not Pam anymore...she's Dora. The two enter the woods. The path leads to the old family cemetery. Pam/Dora tells Amy a story about how she used to feed a fox every day, and she feared that he'd be torn apart by the hounds in the barn. So she released the fox, but then feared hunter's would find him so she took off after him on her horse, Mirage. During the chase, something startled the horse and the horse fell, killing Dora. 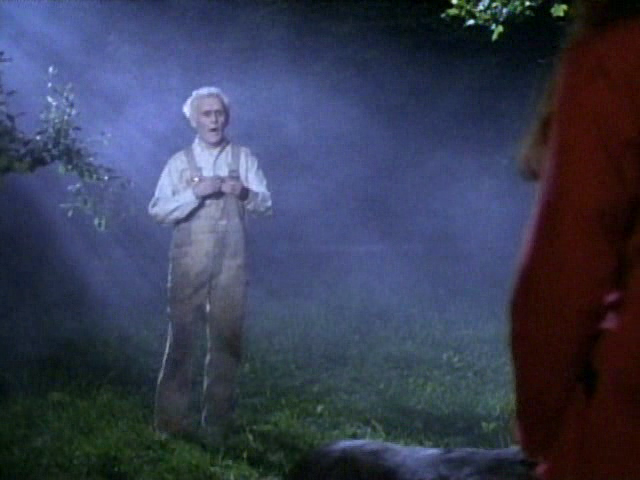 Suddenly another apparition appears -- Giles, the old stable-keeper. He demands that Dora feed the hounds! He scares the girls and they race for the barn. Once inside the barn, Pam/Dora goes to feed the hounds...but Amy stops her, thinking it's crazy. There are no hounds! But suddenly, she hears barking from another room in the barn. Confused, she lock's Pam/Dora in a containing area. Pam/Dora demands that she feed the hounds. Amy doesn't want to be dog food. Pam/Dora tells her where to find the kibble for the dogs. Amy manages to get the dog food and Pam/Dora gets loose and heads to the door to let the dogs in. The hounds sound ravenous and Amy pleads for her not to. The door opens and the dogs come rushing in. Amy drops the bag of food and climbs up on a stack of hay. The dogs run past the food and head towards Amy. Suddenly, Dora's old pet fox darts out of the barn and dogs pursue after. Amy immediately climbs down and looks for Pam. She's nowhere to be found. She finally finds her outside, still as Dora, sitting atop a horse. The horse bolts. Amy runs home. She makes it back to the mystical staircase and heads up and in. She finds Pam in the midst of taking off Dora's old riding jacket. Pam then says she has to feed the dogs. Amy responds, "You only have one dog." Pam reassures, "That's what I said. I have to feed the dog." The two banter back and forth for a moment and then Pam heads off to feed the dog. Amy reaches into her pocket and pulls out a handful of kibble. It was all real. Next episode: S01E06 -- "The Tale of the Super Specs"